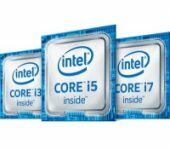 Why has Intel® produced two series of processors? In the H series we always find, coupled to the processor, the chipset QM170 / CM236 / HM110; while processors U Series, as system on chip, have all integrated within them. The U series is the one where they obtained the maximum reduction in consumption. has beeen designed to obtain a reduced TDP in the face of good performances. The comparison is quite disarming if we look at these data, even more if we analyze the data for 8454 against 4793 benchmark. Everything changes completely if we put them in relation about TDP values. Infact this analysis for i7 tells us that: compared to a reduction of about 45% of the performance, it corresponds to a decrease of 65% in TDP. The analysis of i5 processors shows that the i5 6440EQ follows the rule of not having logical cores, as it happened for the S series. This rule is not replicated by the i5 6300U, which is equipped with “only” two physical cores, however, integrated with the corresponding logical, thanks to the presence of hyper threading. Considering these specifications the benckmark data are: 5778 for i5 6440EQ and 4352 for version i5 6300U. We thus see that to a reduction of about 25% of the performance, corresponds a decrease of 65% in TDP. The i3 processors are both equipped with 2 physical cores + 2 logical cores. In this case, the benchmark data (6100H i3 and i3 6100U) are 3951 for H and 3878 for U. We can therefore state that, to a reduction of only 2% of the performance, corresponds a decrease of 65% in TDP. Hopefully this short explanation has been useful to understand the Skylake architectures in details. In TPole we invest energy and resources to constantly develop our technical knowledge and provide customers with high quality advice. We like to call ourselves “Technology Partner” because we work closely with customers to understand in detail their needs and to accompany them in choosing the solution that best fits their needs int erms of costs, consumption and performances. Ask more information to our sales engineers.